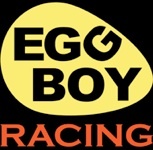 Welcome to Egg Boy Racing! We’re a bunch of guys who used to autocross together and then started racing in the Chump Car World Series in 2010. On June 30, 2012, we won first place at the Chump Car race at Gateway Motorsports Park 7 hour endurance race. And blew a head gasket the next day. Follow us on Facebook or check out our blog for updates on the race car and races, and here are all our photos. Buy our stuff! We don’t make any money off this, but we’ll gladly sell you the shirts off our backs.